Some projects work from the off, they just do. In so much that this new duo is a ‘project’, there is much to be mined from the Great American Songbook. 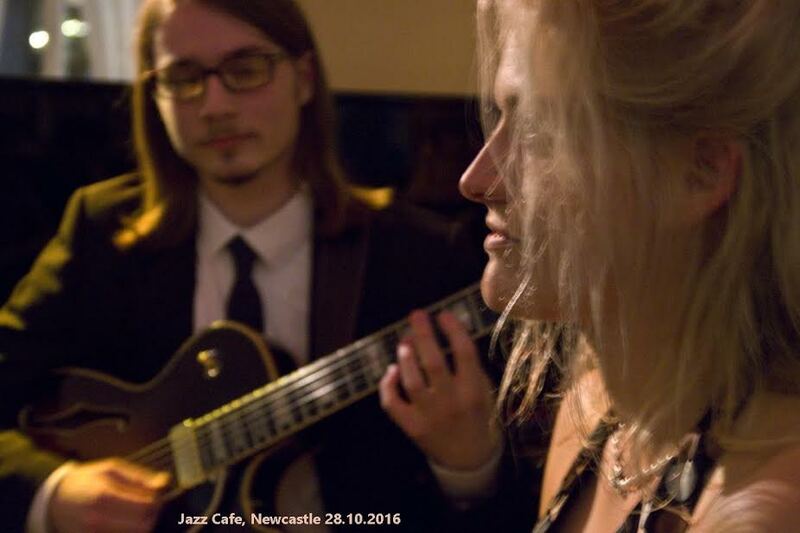 Lindsay Hannon and Bradley Johnston’s debut performance at the Jazz Café in the autumn of last year attracted a full house and this Lit and Phil lunchtime concert similarly drew a capacity audience. As last minute additional seating was being put in place to accommodate the growing numbers, guitarist Bradley Johnston observed that his co-performer Lindsay Hannon had disappeared. It could be a solo jazz guitar concert quipped Johnston. Out of nowhere, Ms. Hannon materialised – dressed in black evening gown and pearls, Johnston in regulation Joe Pass accompanist attire. Ellington, Jobim, Arlen…the GASbook. Discerning listeners showed their appreciation – Yeah! and Yes, Sir! greeting a Hannon verse, a Johnston solo. It’s about timing; Hannon’s honed vocal, taking a lyric for a walk, always arriving at her destination on time, Johnston crafting the lines the tune demands, respecting the art of the composer. Ain’t Got Nothin’ but the Blues, One Note Samba (Hannon’s vocal dexterity), pin-drop silence, a prescient Stormy Weather, the duo heading to the West Coast (Blues). Ella and Joe Pass (and a similar rich vein of material waiting to be mined) could well see the Hannon-Johnston partnership develop and prosper long into the future. The Lit & Phil’s March jazz concert will be on the last day of the month – Friday 31 – featuring the Paul Edis, Paul Susans, Rob Walker trio Triptych. One o’clock start, please arrive in good time as yet another full house is anticipated.